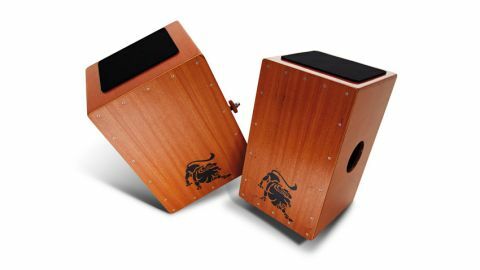 The Lion 3-in-1 Cajon will set you apart from players of the mass-produced models, and considering the customisation and such reasonable outlay, you'd be wise to try them. Wide range of sounds. Build quality. Comfortable foam seat. Value for money. Gary Clarke's Plymouth-based cajon drum company has already attracted a lot of endorsees and provides a unique, tailored service that sets it apart from more established names. "Lion hand-makes several select models in it Devon workshop rather than farming out production to the Far East"
Lion hand-makes several select models in it Devon workshop rather than farming out production to the Far East. Lion's 3-in-1 cajon has traditional dimensions with a height of 46cm and is 30cm both deep and wide. It features plywood construction and comes resplendent in a rather attractive hand-applied 'Natural' wax satin finish and cool Lion logo. It also comes with large wooden feet which is an interesting twist. Rubber is usually the norm but these certainly work out well and give a stable feel in performance. The drum features a highly adjustable snare system via a matching sturdy side-mounted circular control knob, and sports a pair of half-length snare wire sets (totalling 40 wires) that are secured together and form a V-shape against the upper rear of the sound plate. "The 3-in-1 cajon really comes into its own if you need multiple sound options"
The cajon is also topped off nicely with a substantial square foam seat-top which makes extended playing considerably more comfortable. The 3-in-1 cajon really comes into its own if you need multiple sound options and don't want to be carting around several cajons. It has two front plates with the sound hole on the side and offers three distinct sound options. One sound plate gives you a traditional Flamenco option and is equipped with four top quality D'Addario guitar strings, taped to the rear of the front plate and adjustable with the Allen key housed underneath the drum. On the second sound plate, when you turn the control knob on the side you can go from a totally off-response right the way through sloshy options to a super-tight and snappy snare sound. Lion also offers the chance to suggest your own size, colour, finish or wood type on your chosen model and can even apply personal customised graphics for a slight additional cost. This cajon is immediately satisfying to play right out of the box and has a really tactile appeal to it. It garners a wide range of highly musical tones that would sit comfortably in a myriad of settings and styles. "Both the Flamenco and second front plate are super articulate and it's easy to achieve full-quality sounds with them"
There's a 'sharp' edge to the top of the tapa (frontplate) with no sanding off as with most models on the market. If anything, we felt that this actually added some extra snap to the high register and gives a great contrast to the lush bass response. As you might expect, the 3-in-1 Cajon provides a phenomenal range of sound options. Both the Flamenco and second front plate are super articulate and it's easy to achieve full-quality sounds with them. The control knob gives you the flexibility to go from subtle Flamenco with the second front plate 'off' to enhanced levels of sympathetic snare sound if you start engaging the second front plate. With the snare on the second totally disengaged you have a clean and open bongo-like tone but with gradual turns of the knob you can achieve vast degrees of snare response. Drum kit rhythms are easy to emulate and sound convincing with this increased snare presence. Even though Lion call this a 3 in 1, you can actually get many more variations whilst 'wheeling' through its large range of snare options.